Hello, and happy weekend! 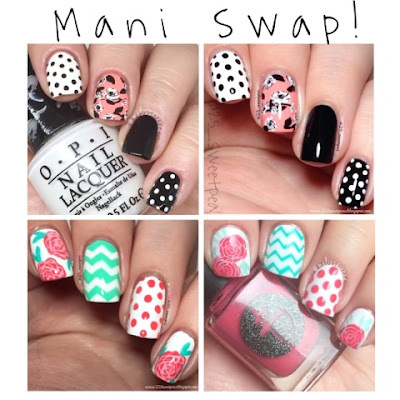 :) Today I have teamed up with my IG friend Melissarenea for a fun mani swap! 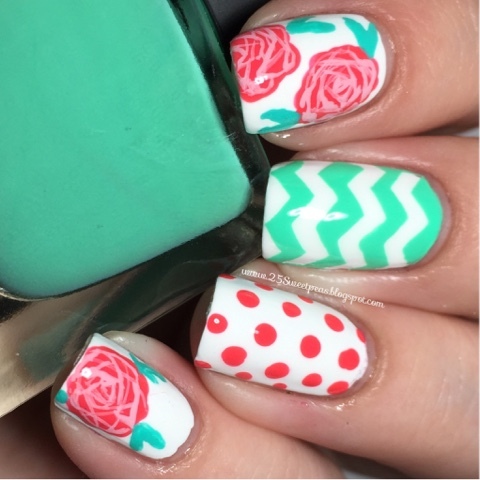 It's been awhile since I've done a mani swap and we have been wanting to work together for awhile so I thought It was about time! :) We both chose a mani of each other's to recreate and it's kind of funny because we both chose florals of each other's! I think we may like florals a bit!! Haha!! So first up let me give you all the details and pictures of mine and then out Collab photo later today on IG! These colors are just so fun! I love them! This design was a lot of fun actually! Oh and you may like to know that at the end of this post there will be a tutorial. ;) so for this look I started out with an all white base. For my white base I used Urban Outfitters Optic White. It's my go to white these days. Most often it only needs one coat and that's great if you are going to do art on top! The corally pink is Wet N Wild Dreamy Poppy, and the minty color is Urban Outfitters Flip Flop. The flowers leaves were done with an acrylic paint, as were the details in the flowers. Yet the base of the flowers and the dots is the Wet N Wild. 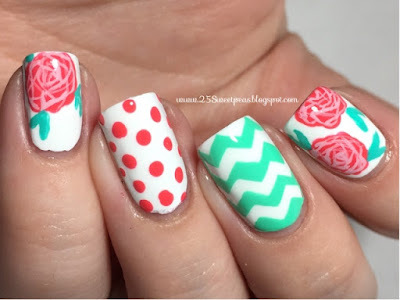 The zig zags were done with Nail Vinyls from WhatsUpNails. I really love them and I can actually use them! Still need to work on placing them but I will get there with more practice. (I hope!) I really love those! They are just super fun! Overall I really just love this look!! 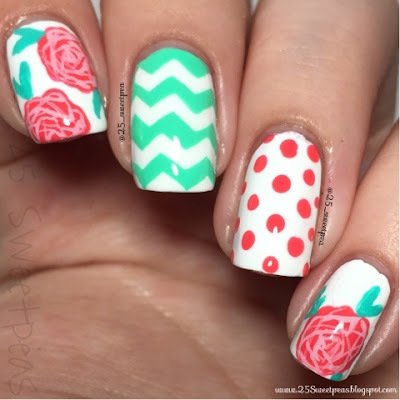 It's so simple yet impressive and eye catching, plus girly and I love girly! ;) Here is our Collab photo! She recreated nails I did earlier this year inspired my an outfit worn by Meghan Trainor! Hers turned out AMAZINGLY! Now here is the tutorial for you all! Well hope you all enjoyed the tutorial and these nails! Let me know what you all thought! Oh and just an FYI the YouTube tutorials are different than my IG tutorials! So YouTube will always be full length, and IG is only 15 seconds. However on IG I get to share my music interests too! I love music and I always put a lot of thought into the song selection for IG. :) Today's is a really good song! Any whoo, hope you enjoy your Saturday!